It’s been a couple of months since we first told you about Z Nation, a new Syfy zombie TV show being filmed in Spokane. Now the “being filmed” part is coming to downtown Spokane, with several road closures this Wednesday, Thursday and Friday from approximately 6 am to 7 pm. Meter bags will be in place to limit parking, and traffic will be limited at certain times. Z Nation is produced by the same company that created Sharknado, in partnership with local studio North By Northwest. It’s Spokane’s first scripted TV series, with a budget rumored to be about $500,000 per episode. The series is set to premiere this fall. So, what part of Spokane is apparently standing in for a zombie-appropriate landscape? The intersection of the road closures at First and Madison is the corner with the Otis Hotel, the former Greyhound Station, the backside of the Fox Theater and the Madison Apartments. Also along that stretch is the Commercial Building, low-income housing, City Gate and the shops along First: Luxe Coffeehouse, Artemis, Scratch, the Music City/Terrain building and more. • Madison Street will be closed from Riverside Ave to 2nd Avenue. Eastbound traffic at Riverside Ave and Sprague Ave will be maintained. • Riverside Ave westbound and eastbound traffic will be closed at Madison Street at times using flaggers, for no more than 10 minutes at one time. • Sprague Ave westbound traffic will be closed at Madison Street at times using flaggers, for no more than 10 minutes at one time. • 1st Ave will be closed from Adams St to Monroe Street. 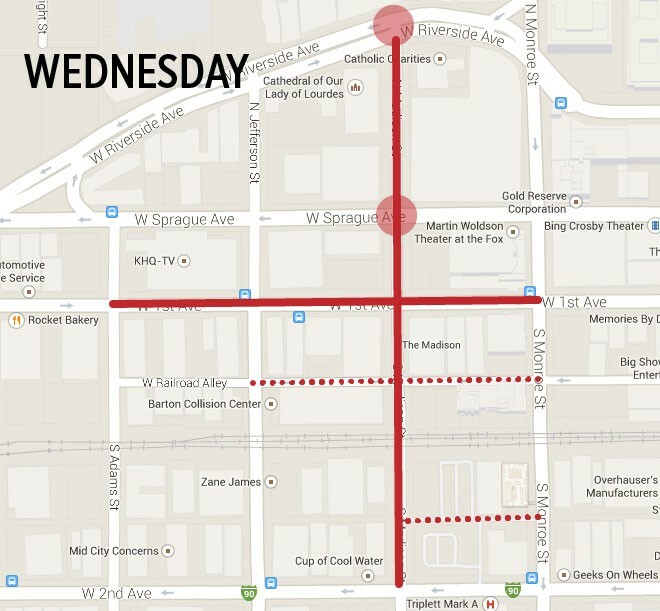 • Two alleys between 1st Ave and 2nd Ave accessing Madison Street will be closed to thru traffic. • Madison Street will be closed from Sprague Ave to 2nd Avenue. • 1st Ave will be closed from Jefferson St to Monroe St to all traffic. • Two alleys between 1st Ave and 2nd Ave accessing Madison Street will be closed. • 1st Ave will be closed from Jefferson St to Monroe Street. 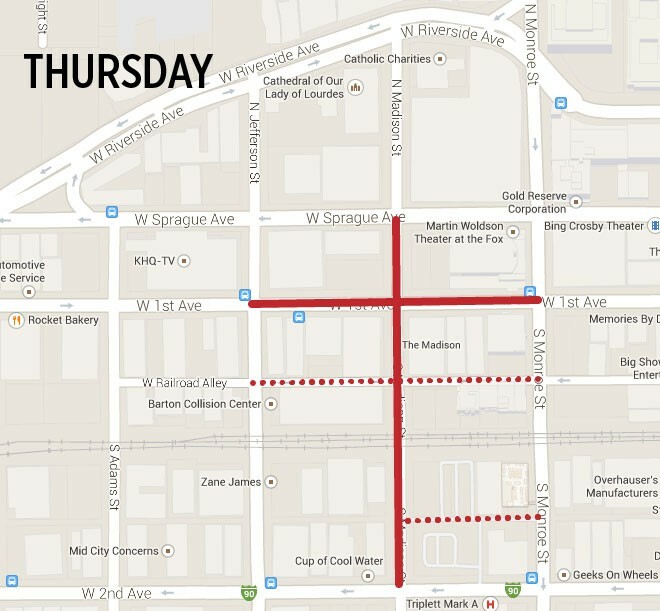 • Madison will be closed from 1st Ave to 2nd Avenue. • Railroad Alley will be closed from Adams St to Monroe Street. 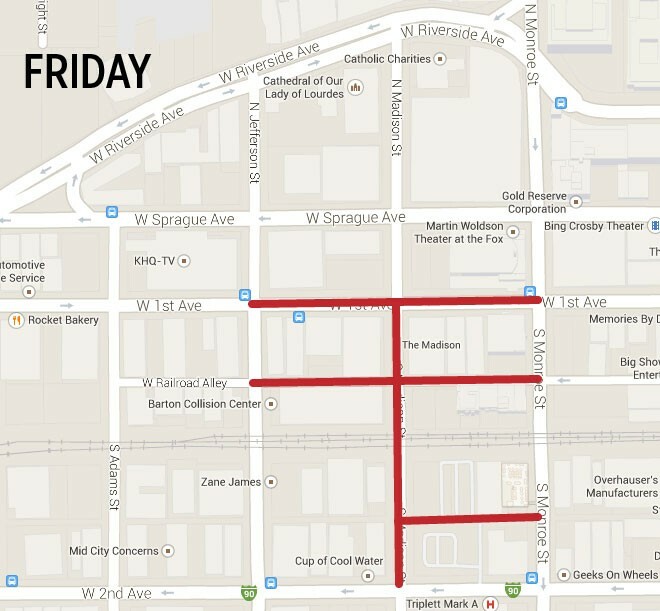 • The alley between Railroad Alley and 2nd Ave from Madison to Monroe Street will be closed.